Geodesic domes are fractional parts of complete geodesic spheres. Actual structures range from less than 5% to 100% (a full sphere). The Spaceship Earth Pavilion constructed by Tishman Construction for AT&T at Disney's Epcot is the best-known example of a full sphere. Geodesic spheres and domes come in various frequencies. The frequency of a dome relates to the number of smaller triangles into which it is subdivided. A high frequency dome has more triangular components and is more smoothly curved and sphere-like. If your web browser is Java-enabled, you can interact with the exhibit on Frequency at right. 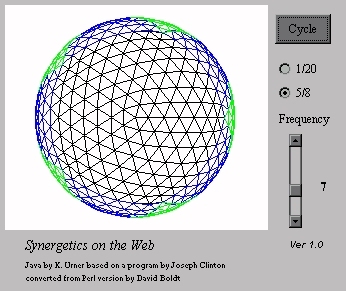 Fuller realized that spheres packed around a nuclear sphere in successive layers give a cuboctahedral shape, which may be distorted into an icosahedron or octahedron via what he called the jitterbug transformation. The network of rods between adjacent spheres in a hollow icosahedral packing gives the framework for the classic geodesic sphere. Geodesic domes may also be based on other polyhedra, such as the octahedron and tetrahedron. The classic geodesic sphere is composed of 20 curved triangles, each of which corresponds to one facet of the icosahedron, a 20-faceted polyhedron. Each of the 20 triangles is curved because it is subdivided into smaller triangles, the corners of which are all pushed out to a constant distance from the sphere's center. The pattern used for this subdividing into smaller triangles is used to classify domes into classes I, II and III.